"Jedediah" reads from the Good Book. Paddling across Green River Lake in the Wind River Mountains of Wyoming. That's Square Top mountain to the right of center. June 2000. Defending the fort at the "School of the Mountain Man" held at Fort Buenaventura in Ogden, UT. Sometimes it takes some help to defend the fort! That's Tom on the far left, then Les, Teton, Rick, Justin and Lee. 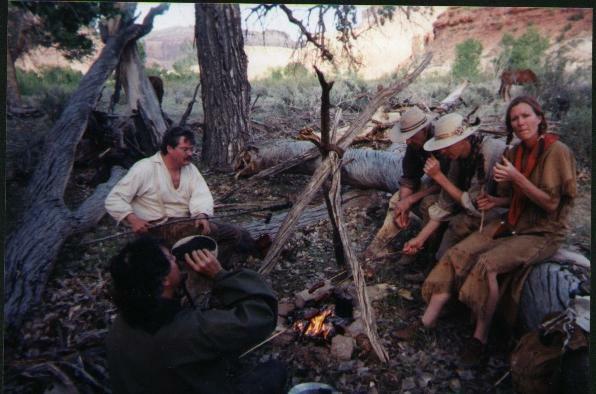 Teton and Rex Norman during the filming of "The Mountain Men" for the History Channel at Pinedale, Wyoming. Playing cards in the shadow of Square Top Mountain. 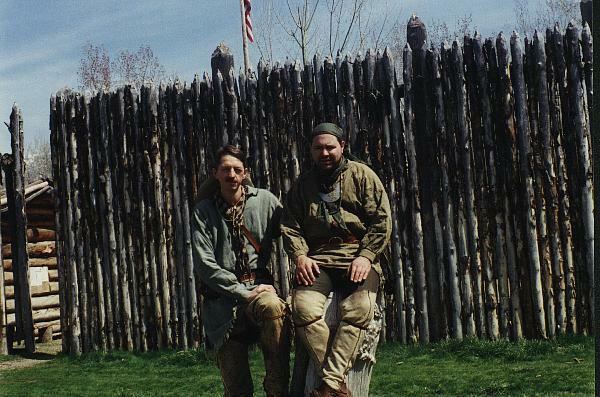 Teton and Lee Cardon at Fort Buenaventura. In camp at Mexican Mountain. 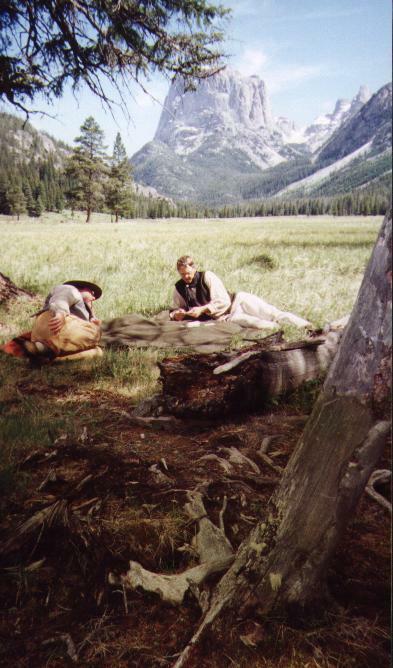 That's Chas Rauch in the foreground, Dean Rudy in the white shirt, Alan Glover on the far end, Teton in the middle and Mary Kaye Rauch sampling her dinner. 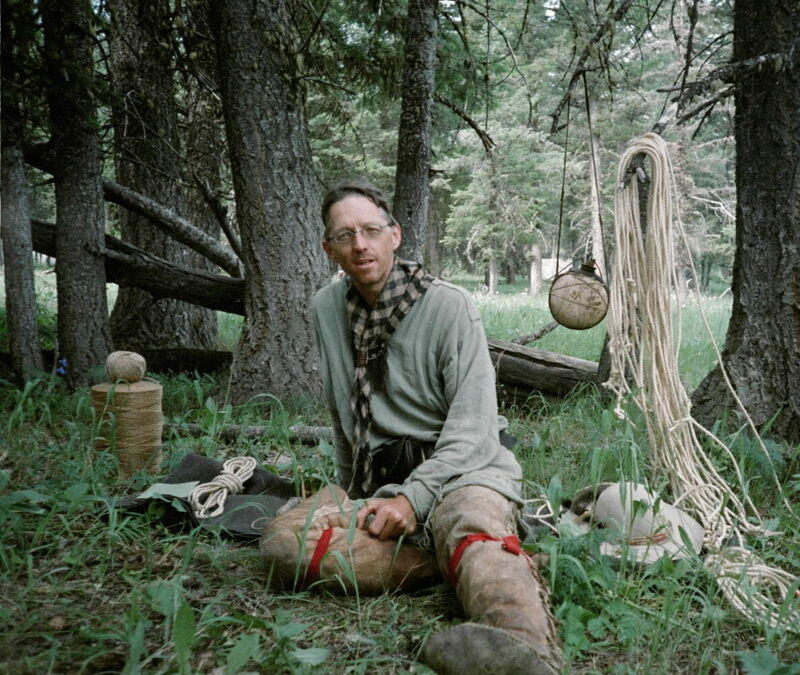 Conducting a class on Knots, Hitches, Lashings and Splices at the AMM National Rendezvous 2001.